Nora Kerrigan Brady, Margaret McCarthy Czervienke, Fr. Frank Fahy, Gail Kniewel Johnson, James Kane, Charles Kerrigan, Margaret Kelly Kerrigan, Barbara Kniewel Ritchie, Patricia Donahue Schwake, and Michael Walsh contributed to this family history. Derreennascooba, County Mayo, 1820-1847. Dominick Foy was born in 1820 on a farm in Derreennascooba. The townland of Derreennascooba is in County Mayo, Ireland, situated on a hillside in the Partry Mountains, just south of Killavally (also called Killawala), a mile south of Kiltarsaghaun, and nine miles south of Castlebar. 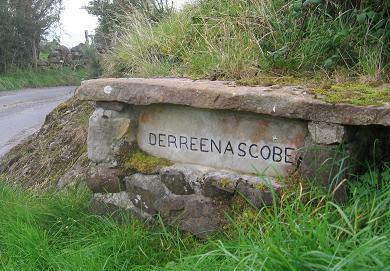 Marker for Derreennascooba (Derreenascobe) townland, south of Killavally (Killawalla), County Mayo, Ireland, 2007. The Foy farm is 0.3 miles south of this sign. 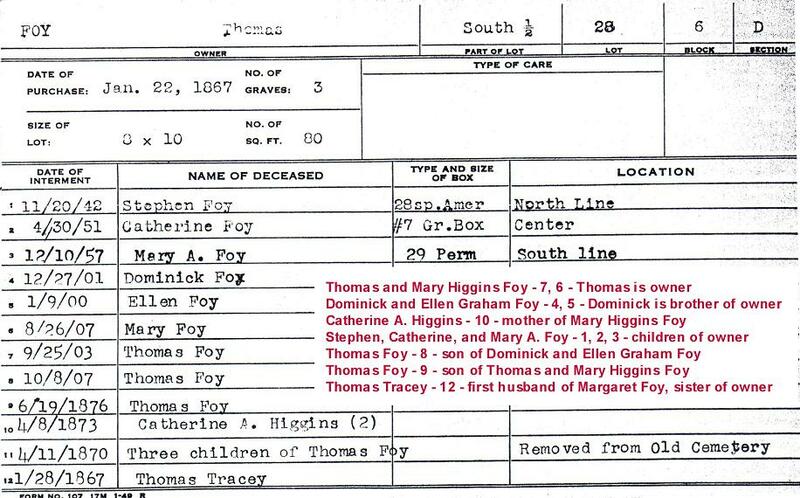 Dominick's parents were Thomas and Mary Tracy Foy. The 1858 Griffiths Valuation shows that the land was leased to Thomas Foy by Malachy Tuohy. The right of occupancy was passed from Thomas Foy to John Foy in 1885 and from John Foy to son Patrick Foy in 1918. In 1939, ownership of the farm was transferred to the Irish Land Commission under the Land Purchases Acts of 1938, and Patrick purchased the farm. In 1970 ownership and occupancy was passed from Patrick Foy to his son-in-law Thomas Kerrigan. Kerrigann/Foy descendants continue to live on the farm. Derreennascooba was the site of one of the first hedge schools in the area. The hedge-school master was Andrew Lavelle. Hedge Schools were a system of schools which became widespread during the 18th century to provide education for Catholics, who were prevented by the penal laws from attending schools. School was set up on the sunny side of a hedge. Later huts or barns were used. Children often took two sods of turf each day for a fire, around which they sat, on cold days. The hedge-school masters were poorly paid, often as little as 6d per quarter. Mary, John, and Norah Kerrigan. 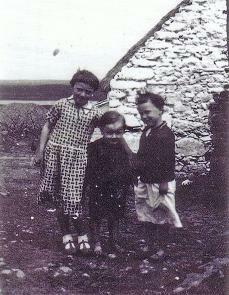 The building in the background is the stone cottage with thatched roof where Dominick Foy was born in Derreennascooba. Source: Charles Kerrigan. 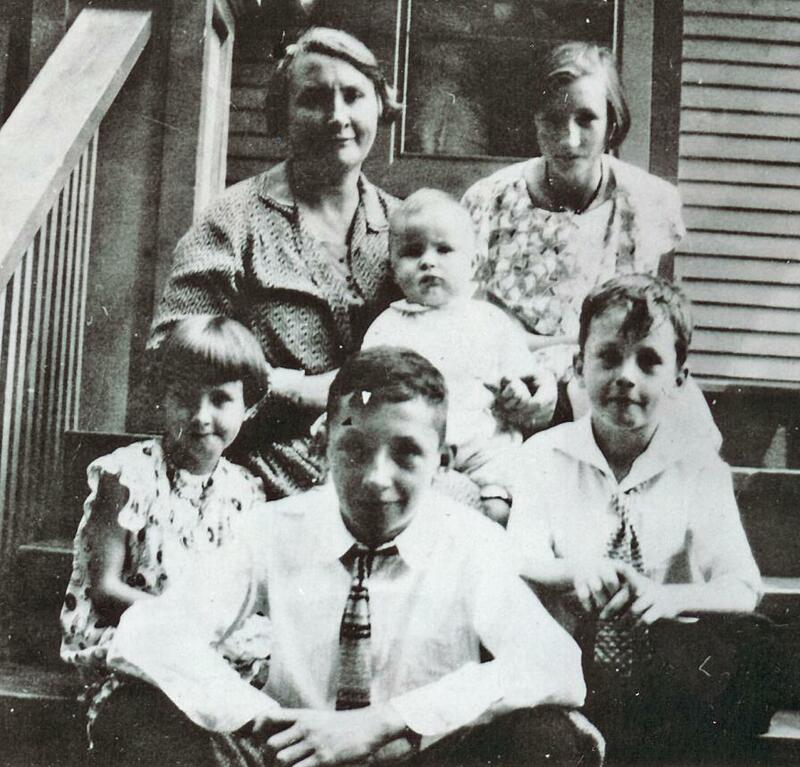 Dominick was the first of five children, four or whom emigrated to Chicago, Illinois, USA. In 1820, Dominick's sister Bridget was born. In 1830, Dominick's brother Thomas was born., Thomas in 1830, and Margaret n 1842. In 1836, Dominick's brother John was born. John was the one who was to stay on the farm in Derreennascooba while the other emigrated to Chicago. In 1842, Dominick's sister Margaret was born. Eastward view of five of 18 sheep on portion of 21-acre Foy farm of Margaret and the late Thomas Joseph Kerrigan. Derreennascooba, south of Killavally (Killawalla), County Mayo, Ireland, 2007. 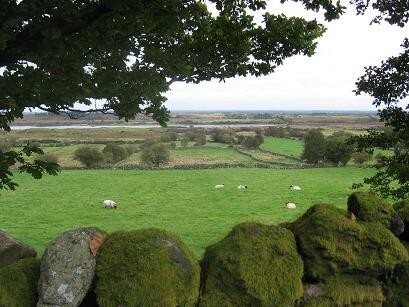 Lough Nacorralea is in the background. Large image. Kiltarsaghaun, County Mayo, 1820-1847. Ann Walsh was born in 1820 in the townland of Kiltarsaghaun, County Mayo, Ireland. 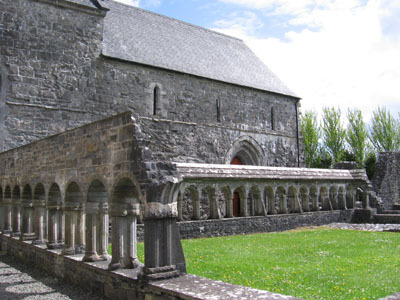 Kiltarsaghaun is situated on a hillside in the Partry Mountains, just south of Killavally (also called Killawala) and eight miles south of Castlebar. The birth place of Kiltarsaghaun is based on the location of Anne's marriage in 1847. 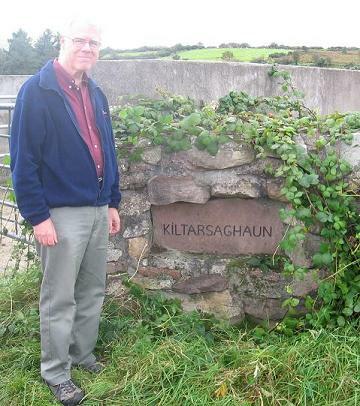 Peter Biggins next to marker for Kiltarsaghaun (Kiltarsachaun) townland, south of Killavally (Killawalla), County Mayo, Ireland, 2007. The name Kiltarsaghaun comes from the Irish "thairseach" meaning "door steps." Prior to the Great Famine (1845-'47), the village was so densely populated that it was said that the "door-steps" were almost on top of each other. The Griffiths Valuation shows that Kiltarsaghaun consisted of 840 acres shared by 36 teannts, 23 acres on average. There were four Walsh tenants out of the 36: Thomas, Richard, Patrick, and Patrick (jun.). Kiltarsaghaun, along with Derreennascooba and Derrindaffderg, was owned by George Henry Moore of Moore Hall. His agent was Malachi Touhy of Kiltarsaghaun who let it to tenants. It is said that no one died on the Moore estate during the famine and no evictions were ever recorded. In 1846, George Moore ran a horse called Coranna in the Chester Gold Cup in England. When Coranna won the cup, he used much of his winnings to alleviate the suffering of the poor in the area. The 1850 U.S. census gives Anne's first name as Nancy, which is a nickname for Anne. Her son John Foy's death certificate gives her last name as Welsh. Dominick Foy and Anne Walsh were married on February 21, 1843, in Kiltarsaghaun. Each was age 23. Witnesses were Thomas Walsh and Mary Foy. The marriage is included on a list of marriages for 1839 to 1849 in Ballintober Parish, County Mayo. Derreennascooba, County Mayo, 1847-1849. Dominick and Anne lived in Derreennascooba following their marriage. Dominick and Anne's first child, Patrick, was born in 1847 and baptized on February 12. Patrick must have died as an infant because he is not shown in the 1850 census in the United States. Dominick and Anne's second child, John, was born in 1848 and baptized on May 7. Nunda, 1849-1850. Dominick and Anne and their one-year old baby, John, immigrated to America. The U.S. flag had 30 stars, the most recent one being for Wisconsin. The President was Zachary Taylor. Dominick and Anne settled initially in Nunda, which is in Livingston County in Western New York State. The 100-mile Genesee Valley Canal, which would connect the Erie Canal in Rochester with the Allegheny River at Olean. The final section of the New York & Erie Railroad, which would connect the Hudson River at Pierpont with Lake Erie at Dunkirk, where steamboats would continue across the lake to Detroit. Nineteen years later, Dominick's son John would work on the Union Pacific Railroad in Wyoming and Utah and be present at the Golden Spike Ceremony at Promontory Point in 1869. In 1850, Dominick's brother Thomas emigrated to America, probably Chicago. Nunda, 1849-1850. Upon the death of his wife Anne, Dominick, 30, was left a widower with one child. His son John would have been two years old. In 1850, Anne Walsh Foy, 30, died. She left a husband Dominick and child John. Anne and Dominick had been married only seven years. Ireland. Mary Breen was born in Ireland. We do not know when or in what county she was born. The death certificate for Mary Foy, the daughter of Dominick and Mary Breen Foy, states that she was the mother of Mary Foy and was born in Ireland. Nunda. Sometime before 1850, Mary Breen immigrated to America. We assume she went to Nunda, New York. The 1860 census shows that Mary Foy was born in New York State. In 1850, Dominick Foy and Mary Breen were married in Nunda, New York. Nunda. In 1851, Dominick and Mary had a child they named Mary. 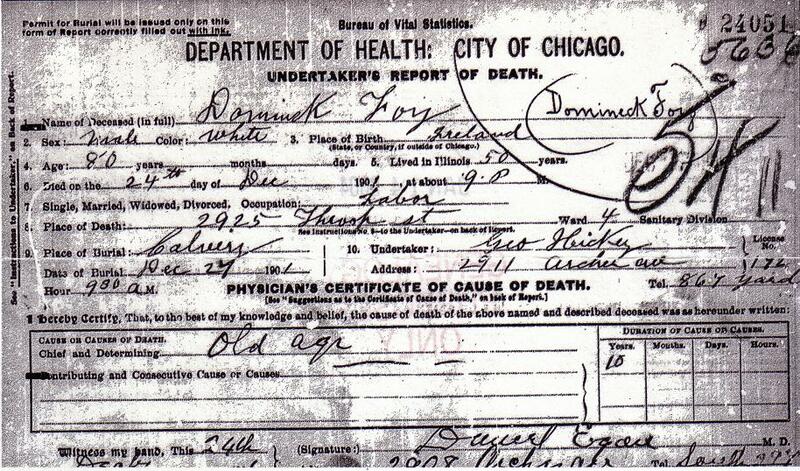 The death certificate for Mary Foy states that her parents were Dominick and Mary Breen Foy. The 1860 census shows that Mary Foy, age 9, was born in New York State. Nunda. Dominick was widowed for the second time in his life upon the death of his second wife Mary sometime between 1851 and 1856. We do not know whether Mary died in Nunda or Chicago. Chicago, Near North Side. Sometime between 1851 and 1856, Dominick moved from Nunda to the Near North Side of Chicago. In 1855, Dominick's brother Thomas married Mary Higgins in Chicago. In 1860, they were living on the Near North Side in Holy Name Parish. Mary Breen died sometime between 1851 and 1856. She left a husband Dominick, a daughter Mary, and a stepson John. We do not know whether Mary died in Nunda or Chicago. Chicago, Near North Side, 1856. 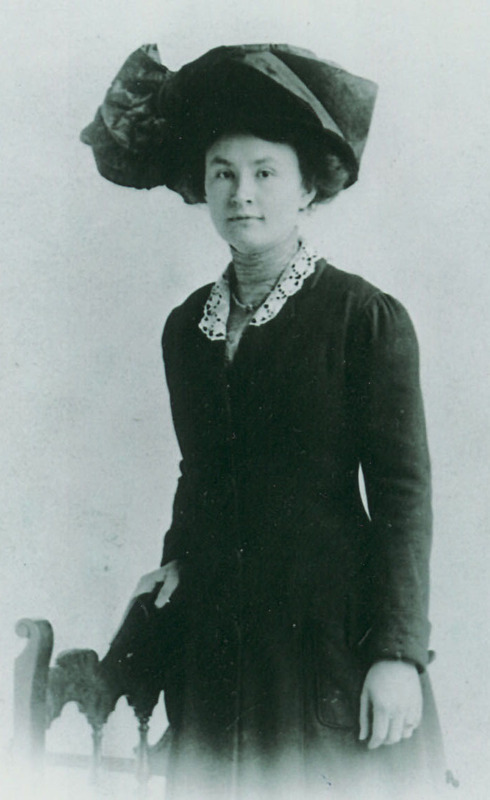 In 1856, at age 26, Ellen immigrated to America. In 1856, there were 31 states in the Union, the latest being California. Franklin Pierce was President of the United States. We do not know where Ellen lived between immigration and marriage. We have assumed she lived on the Near North Side because that is where Dominick, her future husband, lived. In 1856, Dominick Foy, 36, and Ellen Graham, 26, were married in Chicago. In 1857, Dominick and Ellen's first child Bridget was born. In 1858, Dominick's brother John married Bridget Gibbons in Ireland. They lived on the farm in Derreennascooba with Dominick's father Thomas Foy. In 1859, Dominick and Ellen's second child Margaret was born. She was called Maggie. The 1860 census shows Dominick and Ellen living in 7th Ward: between Chicago River and Fullerton and between Chicago River and LaSalle. In 1862, Dominick and Ellen's third child Thomas was born. He was born during the Civil War. Sometime between 1861 and 1866-67, Dominick's sister Margaret emigrated to Chicago. Around 1860, she married Thomas Tracey in Irleand and they had a daughter Mary. 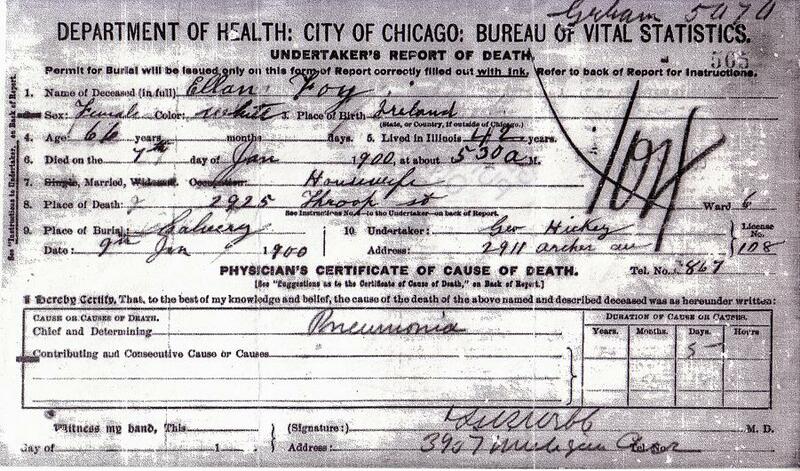 They had a son John in Chicago in 1867. That same year, Margaret's husband died and was buried in Calvary cemetery in a plot purchased by Dominick's brother Thomas. In 1869, Margaret married Cornelius Conway, whose wife had died and left him with four boys. Cathedral of the Holy Name, after the fire, 1871. Source: Chicago and the Great Conflagration, by Elias Colbert and Everett Chamberlin, 1871, p. 328A. The 1866-70 Chicago directories show Dominick living in Holy Name parish on the Near North Side of Chicago at 56 Ohio Street (377 W. Ohio Street after 1909) in Chicago and working as a laborer. This area was in the path of the Chicago Fire that started at 9:30 p.m. on October 9, 1871, on the Near West Side, just north of where Dominick's brother Thomas lived, and spread north and east. By 7 a.m. the next morning the fire reached the Near North Side where Dominick and his family lived. Holy Name cathedral was destroyed. During the nine months that followed, the Relief and Aid Society provided assistance to virtually half the population of Chicago. 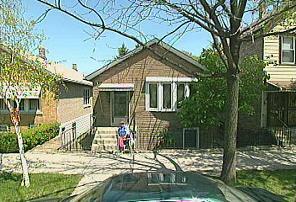 Foy bungalow at 2925 S. Throop Street, Bridgeport section of Chicago, 2000. Chicago, Bridgeport, 1871-1900. Sometime around 1871, probably as a result of the Chicago Fire, Dominick, Ellen, and their four younger children moved four miles south to St. Bridget's parish in the Bridgeport section of Chicago. This area had not been affected by the Chicago Fire. There they purchased a new bungalow at 216 Main Street (2925 S. Throop Street after 1894). 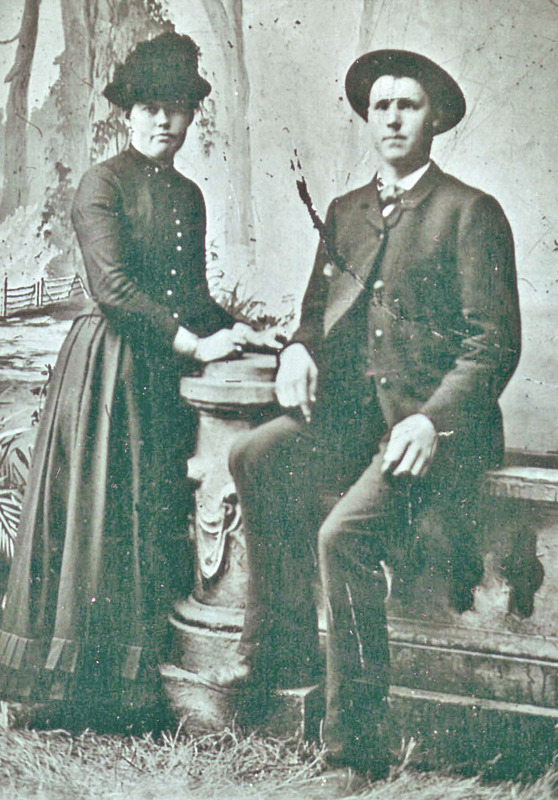 In 1871, Dominick's sister Bridget and her husband and children emigrated to Chicago. Bridget was married to Thomas O'Malley and they had five children born in Ireland. In 1880, street numbers south of 12th Street were changed to conform with the numbered streets. So, 216 Main Street was changed to 2925 Main Street. Upon the death of Amos G. Throop (1811-1894) in 1894, the name of Main Street was changed to Throop. Throop was a Universalist minister and noted abolitionist, who founded Caltech in 1891. He was treasurer of the City of Chicago at the time of the Chicago Fire and was instrumental in securing financing from New York to rebuild the wooden frontier town into a city of brick and mortar. The house is still there. In 1872, Dominick's son John married Mary Stanton. After their wedding, John and Mary lived in Holy Name parish at the rear of 279 N. Market Street (933 N. Orleans Street after renumbering in 1909 and a name change) on the Near North Side of Chicago. They had three children, all born while they lived at 279 Market: William in 1873, Emily in 1878, and Molly in 1879. The 1883 to 1890 directories show John and Mary living in what is now called the "Loop" at 78 Pacific Avenue (502 S. LaSalle Street after renumbering in 1909 and a name change). This was in St. Mary's parish. In 1878, Dominick and Ellen's daughter Bridget is shown in the Chicago directory as a dressmaker living with her parents. On November 29, 1884, Bridget was married to Thomas Rowland at St. Bridget's Church by Father Daniel J. Dowling. They had five children: Sarah in 1885, William F. in 1886, Cecilia in 1888, Mary Ellen in 1890, Gertrude in 1892, and John in 1894. In the 1900 census, they were living on the Near North Side at 129 Chestnut Street (354 W. Chestnut Street after 1909), and Thomas was shown as an excavator. 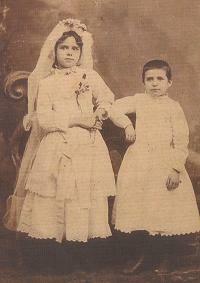 Emily and Molly Foy, daughters of John Foy (1848-1936) and Mary Stanton Foy (1848-1920), at Emily's First Communion, 1886. Bridget Foy Rowland (1857-1936), daughter of Dominick and Ellen Graham Foy and her husband Thomas Rowland (1841-1906). 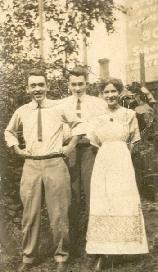 Children of Patrick and Maggie Foy Kane: John, Joseph, and Helen Kane. 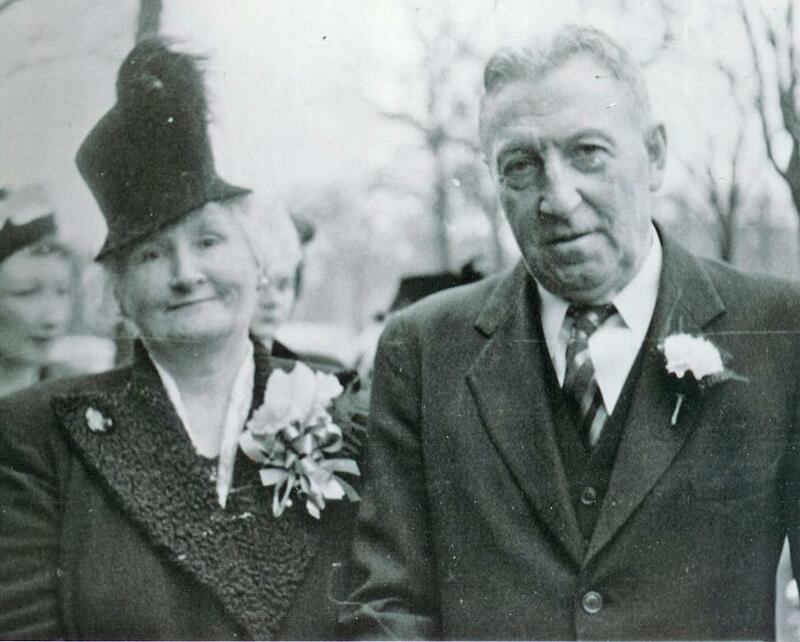 Helen Kane 1888-1976 married Rufus Minogue 1885-1935, and they are grandparents of Father Minogue (right). 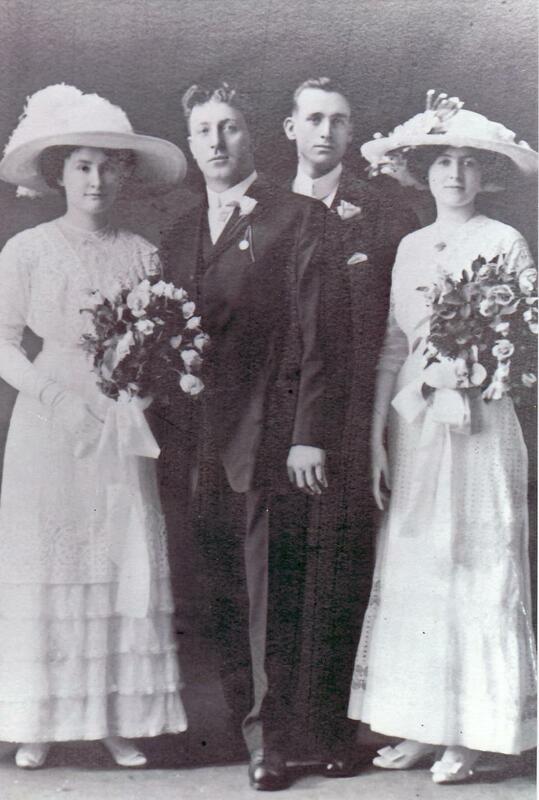 On October 26, 1887, Dominick and Ellen's daughter Margaret married Patrick Kane. They had three children: Helen in 1888, John in 1890, and Joseph Patrick in 1892. Patrick Kane died in 1892 of gangrene of the lung, leaving Margaret a widow at age 28 with two children under age 5 and a third child on the way. At the time of Patrick's death, they were living less than two miles from Margaret's parents in Bridgeport, at 3717 S. Parnell Street. In the 1900 census, they were living on the Near North Side at 122 Townsend Street (858 N. Hudson Avenue after renumbering in 1909 and a name change). This was near Margaret's sister Bridget Foy Rowland. One of Margaret and Patrick's great grandchildren, Rev. 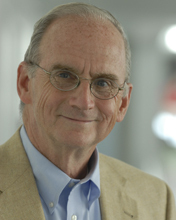 John P. Minogue, C.M., would become President of DePaul University from 1993 to 2004. 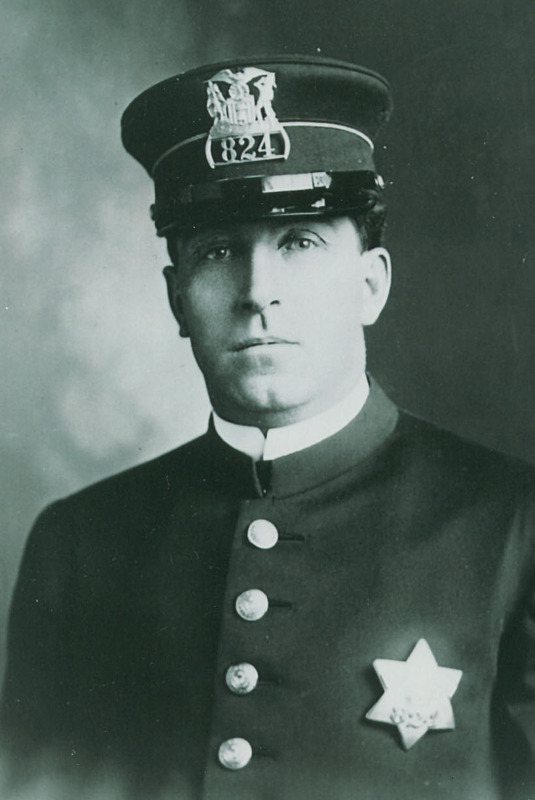 During the 1890s, Finley Peter Dunne, an Irishman from St. Patrick's parish on the West Side, wrote about Bridgeport and a fictional saloonkeeper, Mr. Dooley, in Chicago newspapers. Dunne's Mr. Dooley became nationally known. Eventually, his column was syndicated. Dominick was widowed for the third time in his life upon the death of his third wife Ellen in 1900. Chicago, Bridgeport, 1900-1901. Dominick continued to live in Bridgeport after Ellen's death, with his daughter Mary and son Thomas. He was a widower this time for a little less than two years. Ellen Graham Foy, 69, died at home of pneumonia on January 7, 1900. Following mass at St, Bridget's church in Bridgeport, she was buried at Calvary Cemetery in a plot purchased in 1867 by Dominick�s brother Thomas (Section D, Block 6, Lot 28). St. Bridget's Church in the Bridgeport section of Chicago, 1911. Thomas and Mary Foy continued to live at their father's house at 2925 Throop Street until Thomas' death in 1907. Mary died of breast cancer four years later in 1911. She was living at 355 W. Chestnut Street (not 354) with her sister Bridget Foy Rowland. Probably at the time Thomas died, the house on Throop Street was sold, and Mary moved in with Bridget. 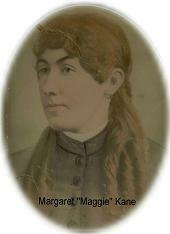 Margaret Foy Kane died in 1910 of bronchitis, asthma, and breast cancer. She had been widowed for 18 years. Her three children were taken in by her brother John and John's daughter Molly. John and Bridget lived until 1936. Dominick died at home of old age on Christmas Eve, December 24, 1901. He was 81 years old based on his age in the 1850 US census. Following mass at St. Bridget's church in Bridgeport, he was buried at Calvary Cemetery next to his wife Ellen in a plot purchased in 1867 by his brother Thomas (Section D, Block 6, Lot 28).